Two distinguished Florida State University researchers have been named fellows of the American Association for the Advancement of Science in recognition of their work to advance science and its application. 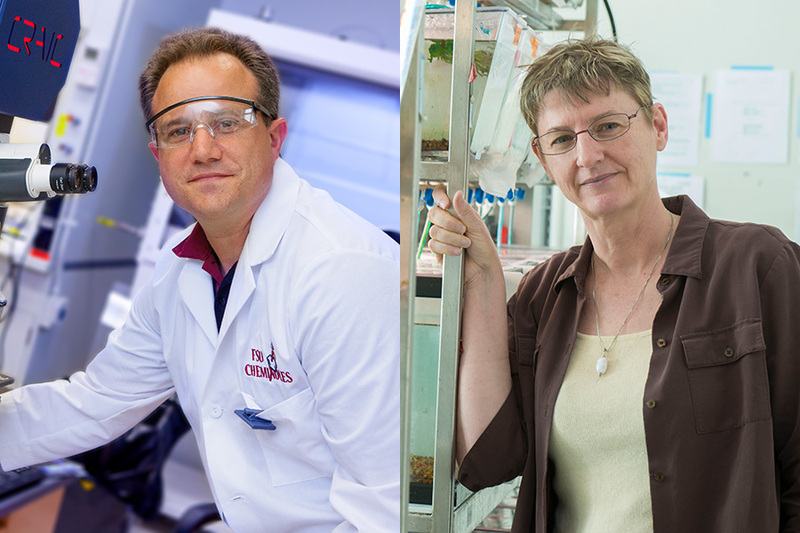 Professor of Chemistry Thomas Albrecht-Schmitt and Professor of Biological Science Kimberly Hughes are being elevated to the rank of fellow this year for their accomplishments in the fields of actinide chemistry and evolutionary ecology, respectively. Albrecht-Schmitt is being honored for the discovery that some of the heaviest elements on the Periodic Table have unexpected parallels with lighter elements and for training the next generation of scientists. “I am deeply honored that the AAAS would honor these years of dedication by remarkable students that have been the key to successfully conducting these challenging studies at the fringes of the periodic table,” Albrecht-Schmitt said. He received his doctoral degree from Northwestern University and taught at Auburn University and University of Notre Dame before coming to FSU in 2012. He holds an endowed professorship in honor of the late Gregory R. Choppin, a nuclear chemist who co-discovered the element mendelevium, and is the recipient of the American Chemical Society’s Glenn T. Seaborg Award for Nuclear Chemistry. Hughes is being honored for her contributions to the field of evolutionary ecology, particularly on non-adaptive theories of aging and context-dependent mating preferences. She received her doctoral degree from University of Chicago and has been a member of the FSU faculty since 2008 after working at University of Illinois and Arizona State University. She will serve as president of the American Genetic Association in 2020 and previously served as president of the Society for the Study of Evolution. She also received a Fulbright award in 2009. Election as an AAAS Fellow is an honor bestowed upon AAAS members by their peers. This year, 416 members have been awarded this honor. New fellows will be presented with an official certificate and a gold and blue rosette pin at the AAAS Fellows Forum during the 2019 AAAS annual meeting in Washington, D.C.
“The AAAS honor reflects clearly these faculty members’ outstanding scholarship, an integral component of the college’s dedication to academic excellence,” said Sam Huckaba, dean of the College of Arts and Science.